What is WYSIWYG eMail editor? So, WYSIWYG eMail editor means that you did what in the editor, you will get what for the real sent out and received emails. Usually, you can directly make many WYSIWYG effects in it by clicks, such as foreground/background color of texts, inserting pictures/hyperlinks, bold/ italic/underline texts, etc. Please note that this editor and its effect are only available for the rich text (HTML) email. Why need the WYSIWYG eMail editor? In fact, the programs use HTML language to generate above effects, but many users cannot use HTML language skillfully - it's the thing for a programmer. So, most programs provide you with the WYSIWYG eMail edition for the normal users, to make a beautiful email, you must need it. Why it is a feature of AMSSE (our sending email to the future application)? As you know, it is provided by most email programs/webmails, also by our sending email to future software. So, why it is a feature? Screenshot A: the WYSIWYG editor of our sending email in future software. With the “Source” tab, the programmers can fine tune the final effect by coding, or add some extra effects. With the “Preview” tab, use can see the final effect like the receivers. And some other features are inserting horizontal line, background color/picture/sound directly. 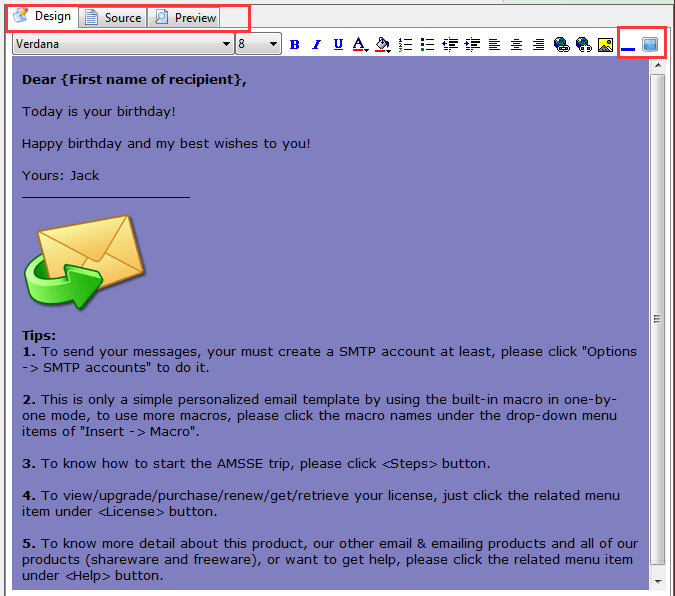 As above, the WYSIWYG eMail editor of AMSSE can do more, so it is a feature of AMSSE also. How to use the WYSIWYG eMail editor in our sending eMail to future program? Easy, change the email type to “Rich text” as below, you will see the WYSIWYG eMail editor on the right side. Screenshot B: the email type of our sending email to future software. And then write your text, set the effects. Every UI control has the tooltip, mouse your mouse on it, you will know what it can do. Usually, you do not need to see the tooltip to understand it, most icons are understandable. Screenshot C: the HTML editor toolbar of our sending email to the future software. Download AMSSE to send email in future!